Amber is twenty weeks pregnant. Somewhere in the vicinity of July 26th 2014, a baby boy will be joining our family: Archer James Jarrett. This blog is the dual to Raising Elora, the blog for Archer's older sister, Elora. 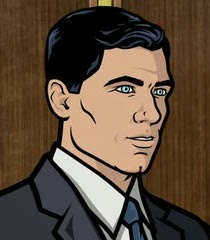 Why does Archer (or Elora) need a blog? I covered this in the introductory post of Raising Elora. There will be pictures, stats and other content of interest to those who have an interest in our son. Because he's the world's greatest secret agent! Boy names were always a bigger debate between us than the girl names. Amber's love of Gaelic boy names often ran afoul of my desire for strong and simple (some would even say boring) names. "Hunter" would have worked, if not for already having Hunter the Cat. Wolf was briefly in the running. Sadly, the universe of Willow was not an effective source for boys names - I was vetoed on both Airk and Kael. I have been informed, though without any backing evidence, that "Madmartigan" is not an appropriate name for a child. Up to and during the early weeks of pregnancy, our first pick was actually "Dylan". Archer came up, and while not initially our first choice, it quickly took root, and within a few weeks seemed like a foregone conclusion. That's all for now. Ultrasounds and stats coming soon.